I hope everyone had a wonderful Thanksgiving weekend. I had a grand ol' time celebrating in Florida with Ryan and my in-laws. I brought my camera along but failed to take pictures (don't you hate when you do that?!). I wish I could share a photo or two with you to show you how beautiful Sanibel Island was, but alas, you will have to use your imagination. Imagine beautiful sunny days and blue ocean. It was amazing! I have to say, now that it's officially okay to pump the Christmas music and deck out our apartment in Christmas decor, I've done just that! I just love this time of year. Our apartment is slowly but surely being transformed into a Christmas wonderland. 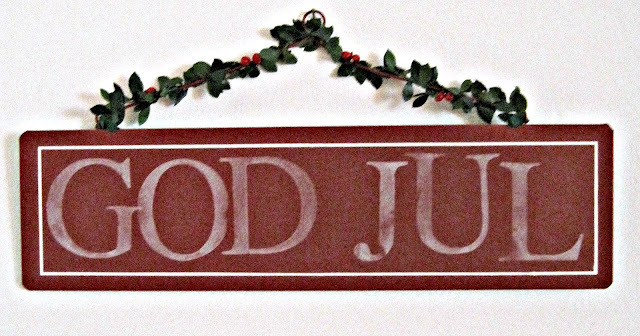 A new addition this year is the above "God Jul" sign (Merry Christmas in Swedish). I hung it up in our living room and love taking a gander every now and then. 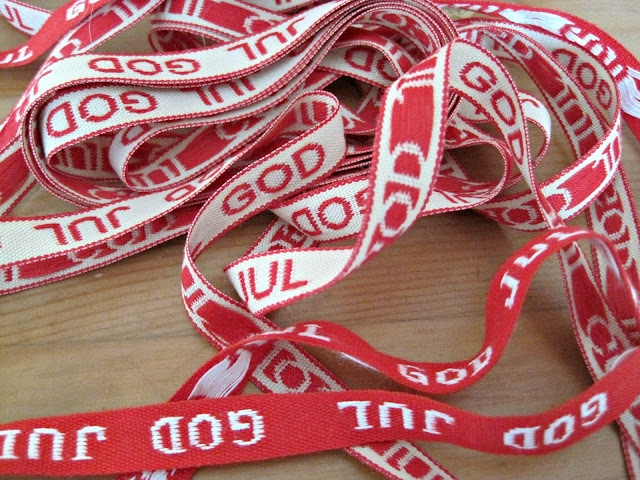 And I am still trying to figure out what to do with all this awesome "God Jul" ribbon my mom sent me, any ideas? Besides Christmas, I'm also gearing up for the 2012 Scandinavian Christmas series starting December 13! There are a few new guest bloggers this year along with some bloggers who have participated in years past. It is going to be great, don't miss out! And one last bit of news here, RYAN GOT A JOB!!!!!!! WOO! We are quite excited if you can't already tell. :) Good thing I was relishing our mornings together because now Ryan is out the door by 8:00 AM. Which leaves me with a few hours to clean and run errands craft and drink copious amounts of coffee every morning. With the craft fair being only 2 weeks away (yelp!) I definitely can use the time! This weekend I got to take an amazing Shibori Indigo class with Glennis Dolce for my birthday (thank you Ryan and fam!) and it was incredible! 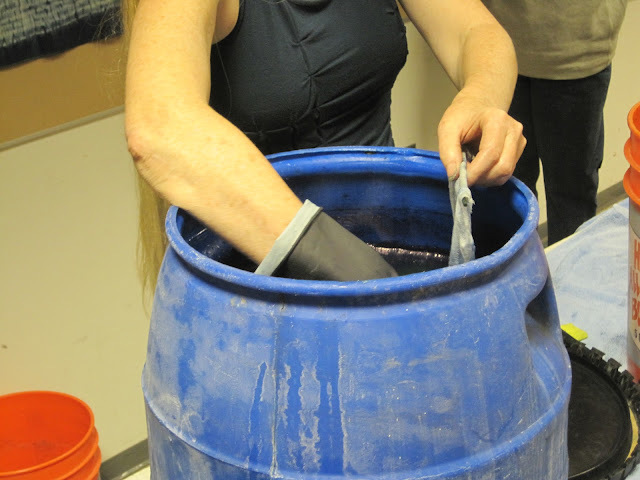 I have never dyed with indigo before and it was so fascinating. 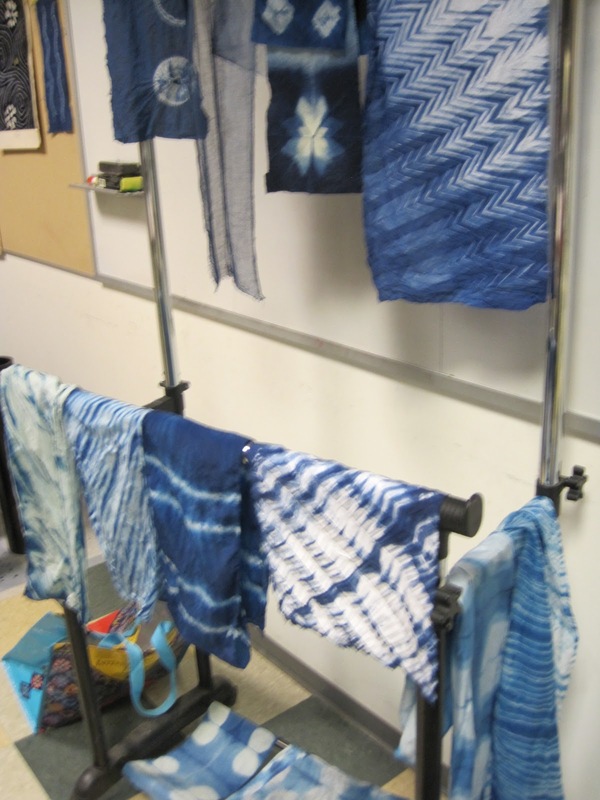 Did you know the indigo dye is actually greenish-yellow when in its dye form and it doesn't turn into the beautiful blue until it becomes oxidized?! I definitely had no clue until yesterday. 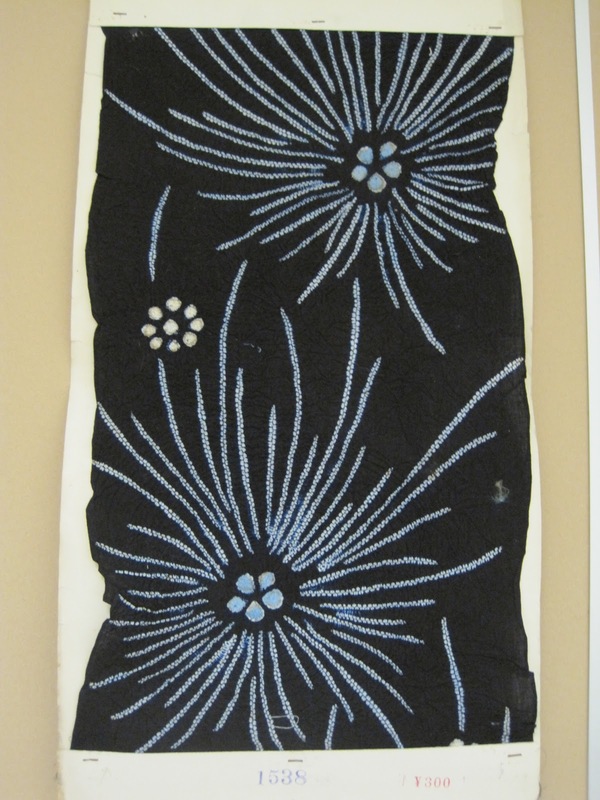 Below is one of my favorite dyed indigo swatches from class. It was directly from Japan and quite intricate. This is one piece I did that I tried to add a Scandinavian touch to. :-) I used a picture of some Rosemaling as inspiration and broke it down into a basic design. Then I used a folded running stitch before dying. It was time consuming and tedious, but I am glad I gave it a go. 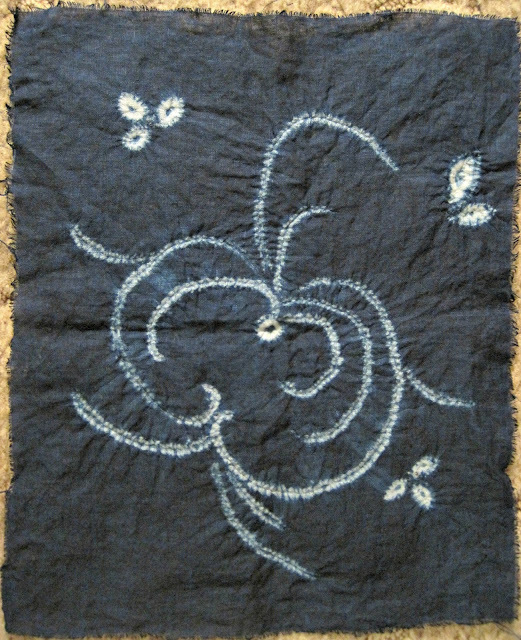 The piece above was done on linen. I loved the linen the most of all the fabrics we got to work with. 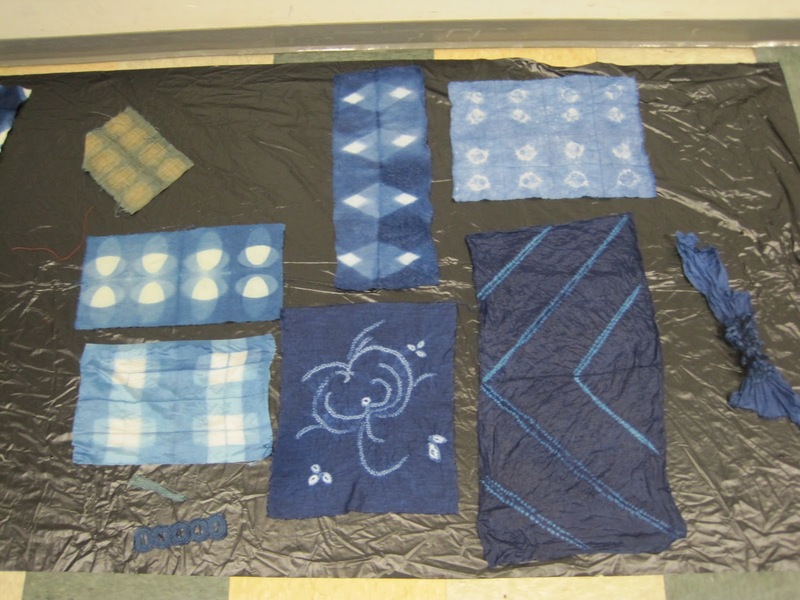 We also got to work with bamboo batting, raw silk, different cottons, silk noil, hemp, antique trims, and a couple other fabrics that I don't remember the names of. And after class, I compiled a few of my favorite swatches and threw them into a frame for fun. 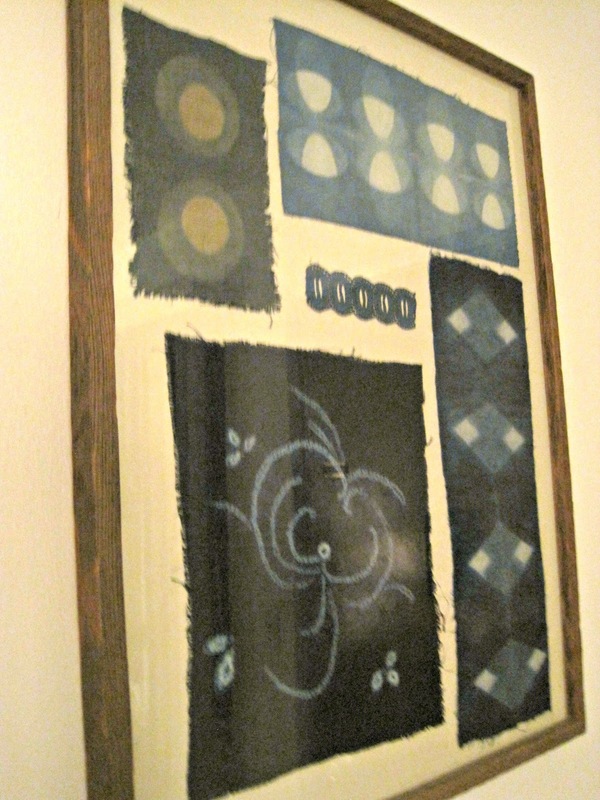 We had this frame around from Goodwill last year so I flipped the art around and arranged my swatches on the other side. Ryan has coined it, "Color study #1". Overall, I learned a ton and met some really fun people. A success! I am showing you this picture of my kitchen table, not to show you how messy it is, but just because I want to document and remember this everyday moment of me and Ryan's life right now. Right now, we are so blessed to get to spend [most] of our mornings together until almost noon! I know that will not always be the case, and I am reveling in it now. 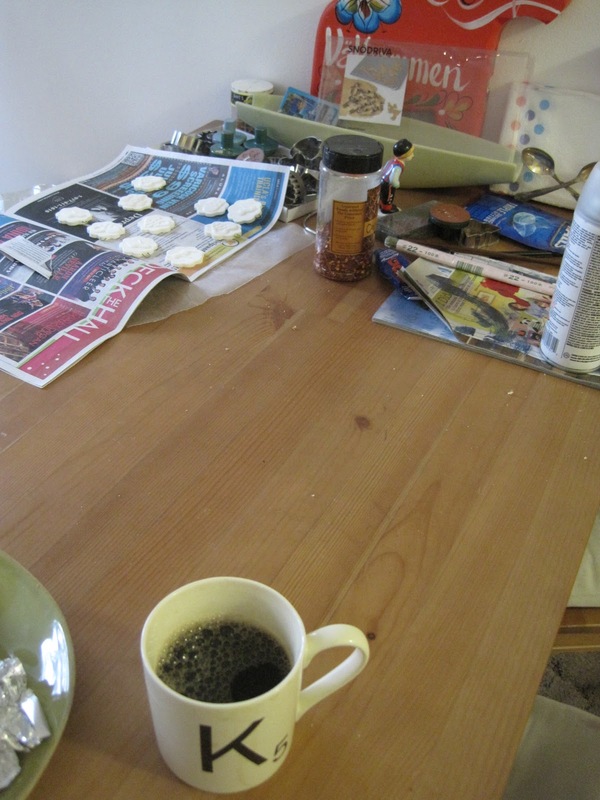 Even if it means I have to push all of my crafting mess to one side of the table so we can eat breakfast together. It is great. After our breakfast, we went for a short run. We are training for the LA Marathon this March! This will be my 3rd full marathon and Ryan's very 1st. We are soooo excited! 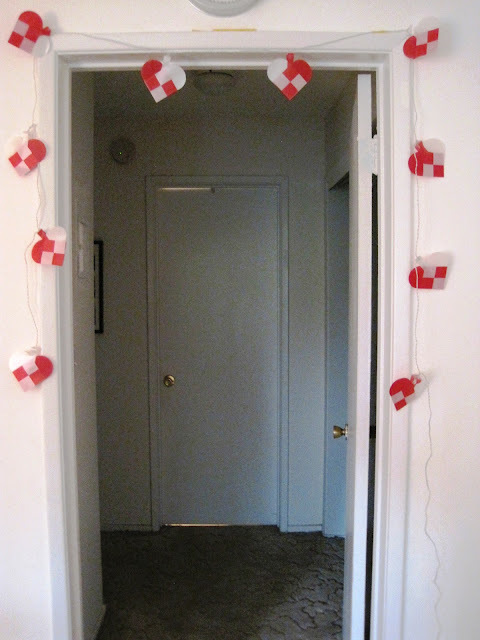 Then, I must admit, I turned on my woven heart light strand (thank you, IKEA), turned on some Christmas music, and enjoyed the rest of my leisurely morning by getting a few more crafts done for the Christmas fair in just a few weeks! Woah. It has been a grand week. And it's almost Friday, yay! How's your Monday treating you? I'm typically not the biggest of fans of Mondays, but today has been a great day. I worked a reverse hour day, so I got off at 3 PM. Awesome! 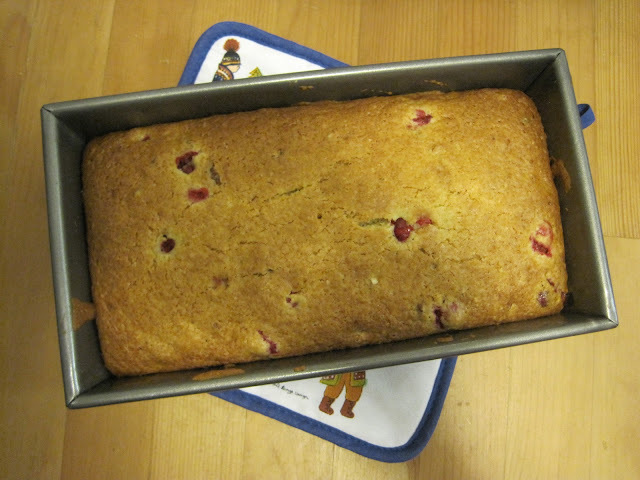 I had time to talk with my parents, clean the apartment, and bake some cranberry-orange bread with fresh cranberries. I love this time of year when fresh cranberries start to become plentiful in the grocery store. Love it. It's going to be a good week, I can feel it in my bones! Here is my first try at freezer paper stenciling! Tutorial to come! It's pretty fun and quick to do. Although, you do have to be quite meticulous as you cut out the stencils...one wrong slip of the scissors and there goes your stencil! I tried another viking hat in navy blue, but the paint seeped through some of the edges so it didn't really turn out. I am going to see if I can salvage it later. I can't believe it's November already?! Wow. This year flew by. I can't wait to be with family in a couple short weeks eating turkey and tons of delicious-ness. Yummm. Hope your week is going well - Happy Wednesday! Great news! 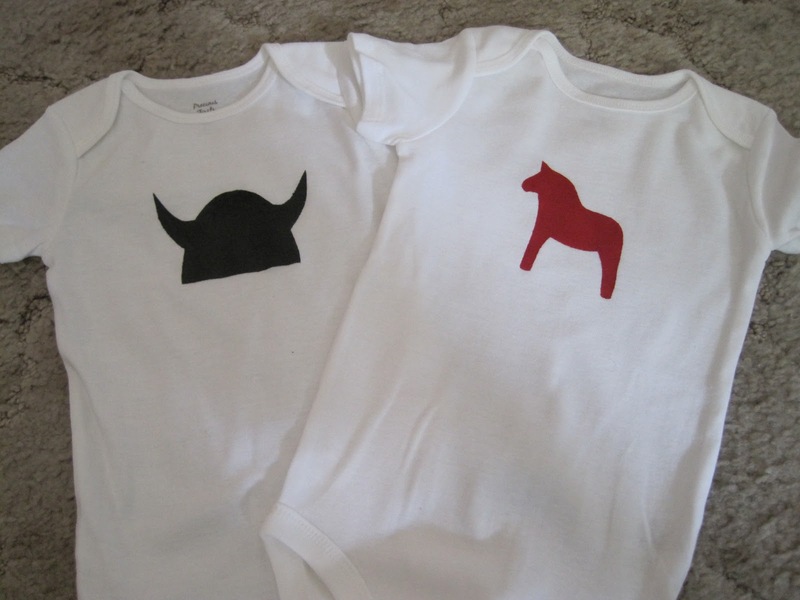 Beth and I are officially accepted to the 2012 Los Angeles Swedish Christmas Fair (aka Lucia festival)! Woooooo! We are so stoked and have been frantically creating and brainstorming things to make. My mom sent me some awesome supplies to get me started (thanks, mom! 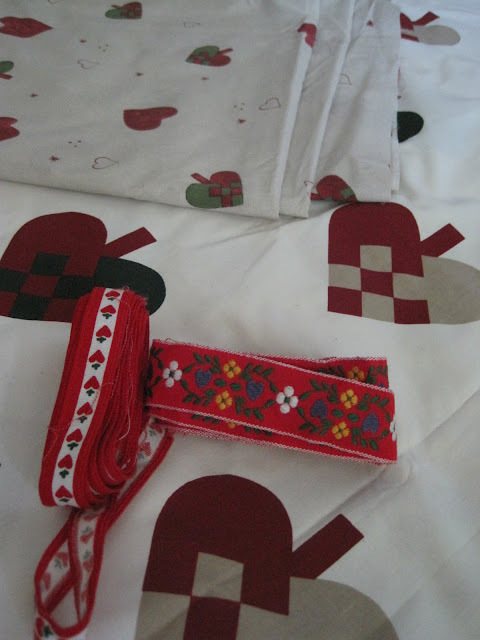 ), including the adorable fabric you see below (direct from the motherland) and that cute ribbon too. 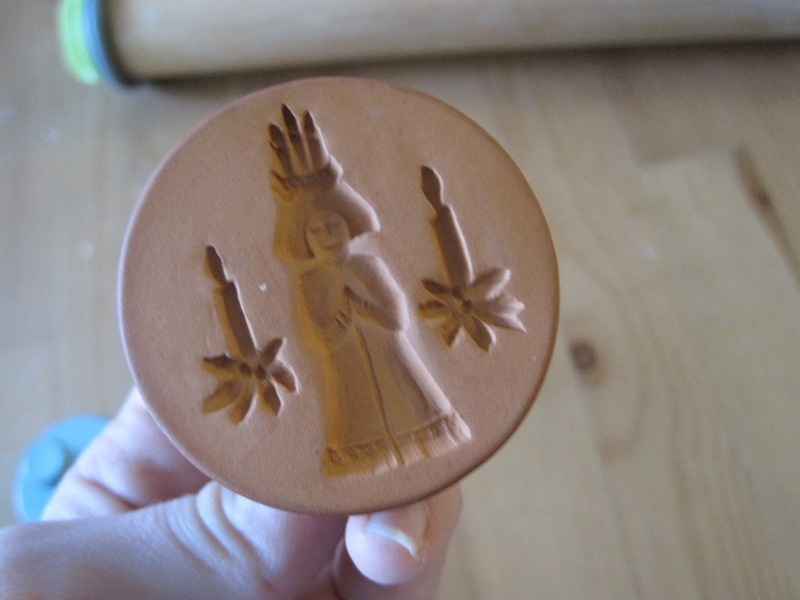 And she has the really cool cookie stamps in different Scandinavian shapes that I used to make ornaments with. Below is one of St. Lucia. 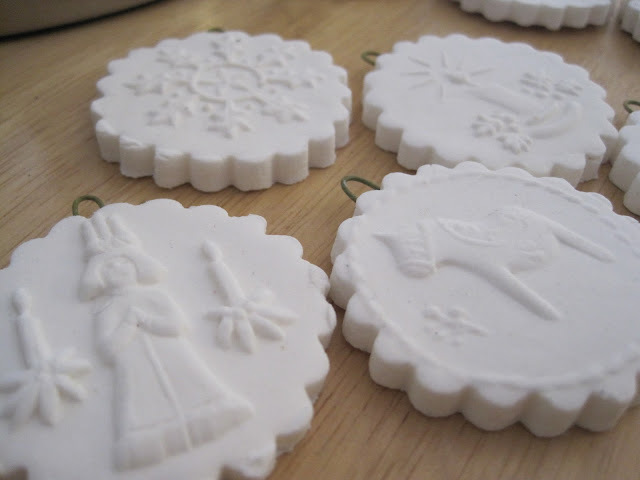 She also sent stamps of a Dala horse, snowflake, advent candle, and heart. I used them to stamp into a preservable dough (tutorial to come later), then cut them out with an antique biscuit cutter Ryan and I found at an antique shop in Paso Robles a month back. I will get better pictures of them later to show you all. After the fair, I will put some up in my Etsy shop too, so stay tuned! 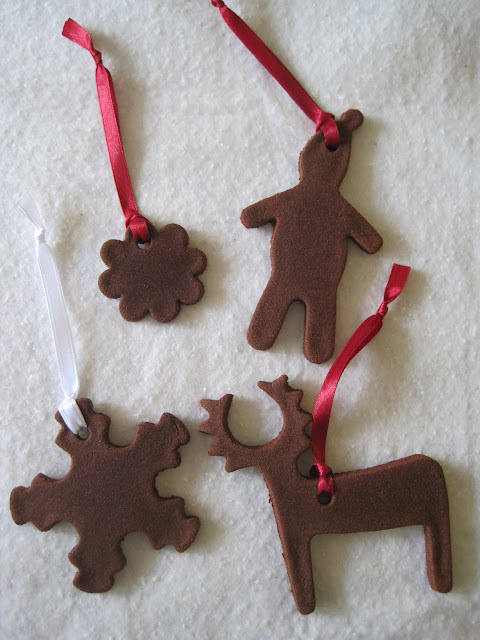 And I also made these little guys from some cinnamon dough. I used my IKEA cookie cutters and poked holes with a straw. They smell amazing! I've made a few other things too, but haven't had time to take photos yet. More to come! And speaking of Scandinavian Christmas things, I still have a few slots open for guest bloggers for the Scandinavian Christmas series this year if you'd like to join! Or, if you know of someone who would like to, please have them email me.